Today I’d like to talk about mordants. The word mordant comes from the French word “mordre” – to bite. The mordant combines with a natural dye and fixes the color to the material. Mordants make the color richer, lightfast and wash-fast. Using the right mordant is like cooking you would never substitute salt for sugar! The following 3 mordants are the refined state of Bauxite (the raw state of aluminum ore). 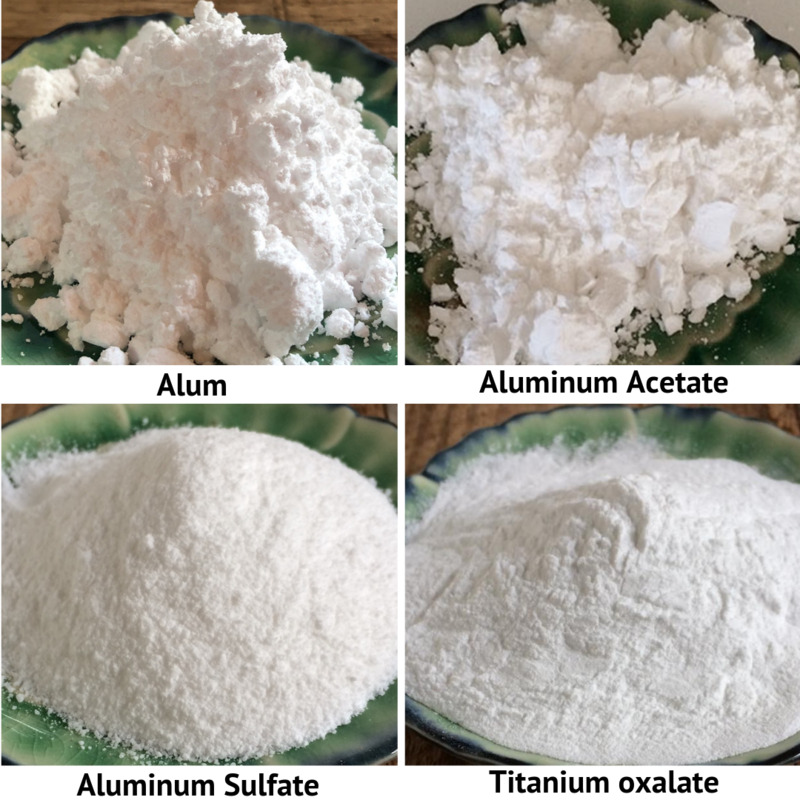 Alum (Potassium aluminum sulfate) – Alum is probably the most commonly used non-toxic mordant and can be used with both protein and cellulose fibers. It is economical. Dyers often will add Cream of Tartar to obtain brighter colors. Aluminum Acetate is a highly refined version of Alum and therefore more expensive. It is the ideal mordant for cellulose and is often combined with a clear tannin for even better results. Aluminum sulfate is Alum without the Potassium and the amount needed for good results is lower than Alum. It also will give brighter colors without the need for Cream of Tartar. Our final mordant is Titanium oxalate. Titanium oxalate has been used for tanning leather, and is growing in popularity with natural dyers. It can give shades of orange in combination with tannins and yellows. When working with mordants we recommend the use of gloves and masks. Here are 6 natural dye assists that I like to call color changers. 1-Chalk (Calcium Carbonate) – is used as a color changer. If you have “soft” water the addition of chalk to your dyebath will make your water “harder”. It is especially useful to make madder dye-baths redder. 2-Citric Acid – an organic acid with a pH of less than 7. It is used with Lac to bring out the strongest color. Acidic modifiers will make a more yellow tone (changing madder red to madder orange). Acidic modifiers can be used in the dyebath or as an after-bath. 3-Cream of Tartar – a by-product of wine making. It is an organic acid with a pH of less than 7. It is an optional addition to the Alum mordant bath. It will keep wool soft, brighten colors and change some dye colors (Cochineal will go from fuchsia to red with the use of Cream of Tartar). Cream of Tartar works best on protein fibers and is rarely used with plant fibers. 4-Iron (Ferrous Sulfate) – Iron is best for use with plant fibers. Iron can be used as part of the mordanting process, in the dye-bath or as an after-bath. Iron will deepen and sadden (grey) your colors and can change yellows to greens. 5-Soda Ash (Sodium Carbonate) – an alkaline modifier. Soda Ash increases the effectiveness of a mordant and can change colors dramatically (Brazilwood will go from red to pink). Soda Ash is also used in conjunction with a soap product to scour cellulose fibers. 6-Tartaric Acid – a by-product of wine making. It is an organic acid with a pH of less than 7. Recommended for wool and silk when mordanting with Alum. 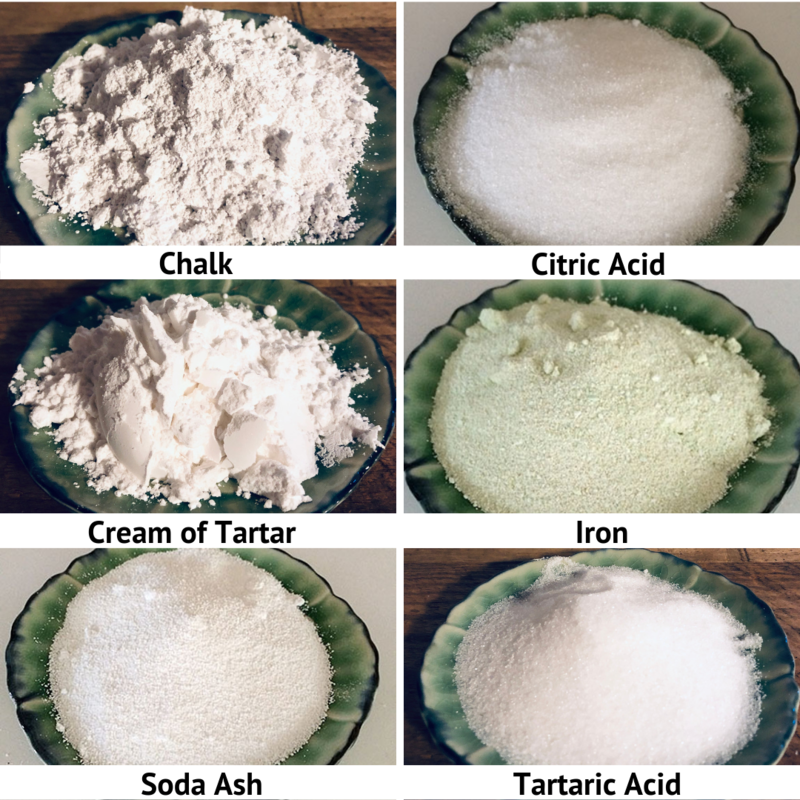 Tartaric acid will give different shades than Cream of Tartar. It is highly recommended when dyeing with Cochineal. Tartaric Acid works best on protein fibers and is rarely used with plant fibers. Indigo assists – There are far too many ways to make an indigo vat to go into here. All over the world indigo vats are created differently – all with the same result – beautiful blue! I will briefly touch on a few of them that I work with here. Michel Garcia’s 1,2,3 vat uses 1 part indigo, 2 parts hydrated lime (Calcium hydroxide) and three parts either fructose crystalline or henna powder. The 1,2,3 ferrous vat uses 1 part indigo, 2 parts iron (Ferrous sulfate) and 3 parts hydrated lime (Calcium hydroxide). A natural ferment vat may use indigo, cooked bran, ground madder root and soda ash (Sodium carbonate). A chemical vat may use indigo, thiourea dioxide and soda ash (instead of Lye – Sodium hydroxide/Caustic soda). Hide glue is used when working with wool. It is hydrated and introduced into the indigo vat to protect the wool from the alkalinity of the vat. 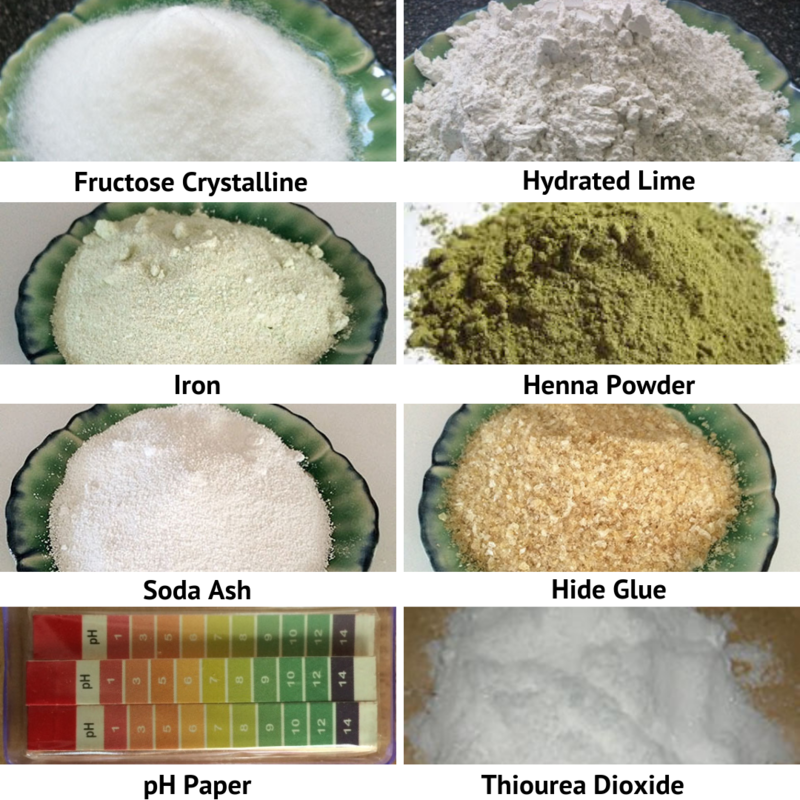 pH papers are an aid in determining the pH of your vat (acid, basic or neutral), which varies for protein and cellulose. Natural Thickeners – Natural dye extracts can be thickened for painting, stamping and printing. 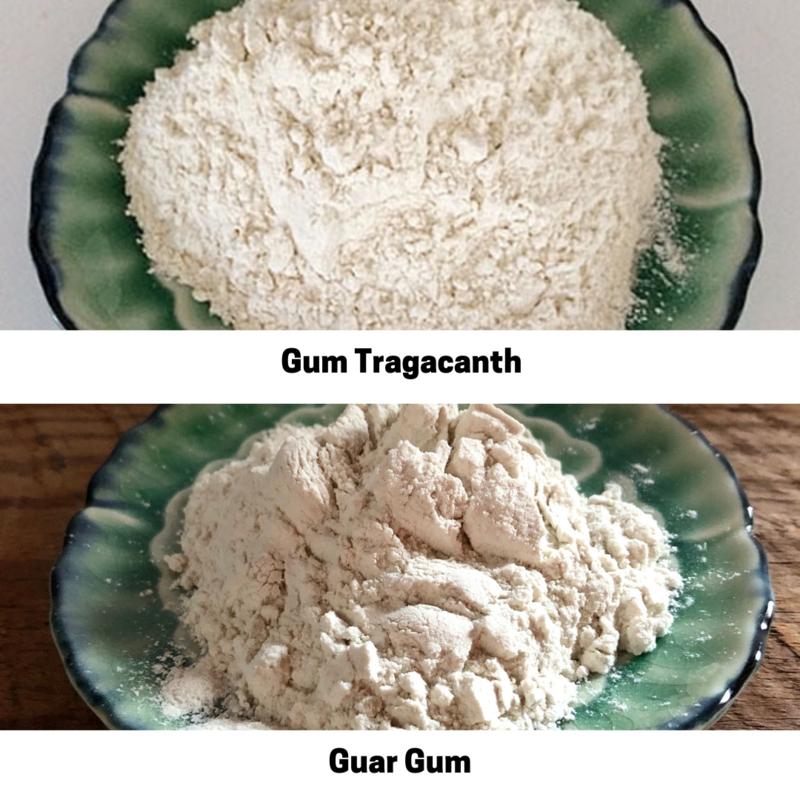 1) Gum tragacanth (Astragalus gummifier) works well with dye extracts and will not affect the color. It has been in use since ancient times and is still collected by hand. 2) Guar gum comes from (Cyamopsis tetragonolobus (L) Taub) is extracted from the Guar beans. Guar gum is a natural thickening, stabilizing and emulsifying agent used in the food industry as well as for other applications. It works well with dye extracts and will not affect the color. Scours – It is important to properly scour (pre-wash your fiber, fabric or yarn prior to dyeing. 1) “Earthues Silkzorb Degummer is liquid enzyme that remove excess sericin in silk fibers, allowing for a deeper penetration of dye and deeper shades. Use with a small amount of soda ash and Earthues Cellulose Scour.” 2) “Earthues Cellulose Scour – is designed for use with cellulose fibers and as part of the Silkzorb degumming process. 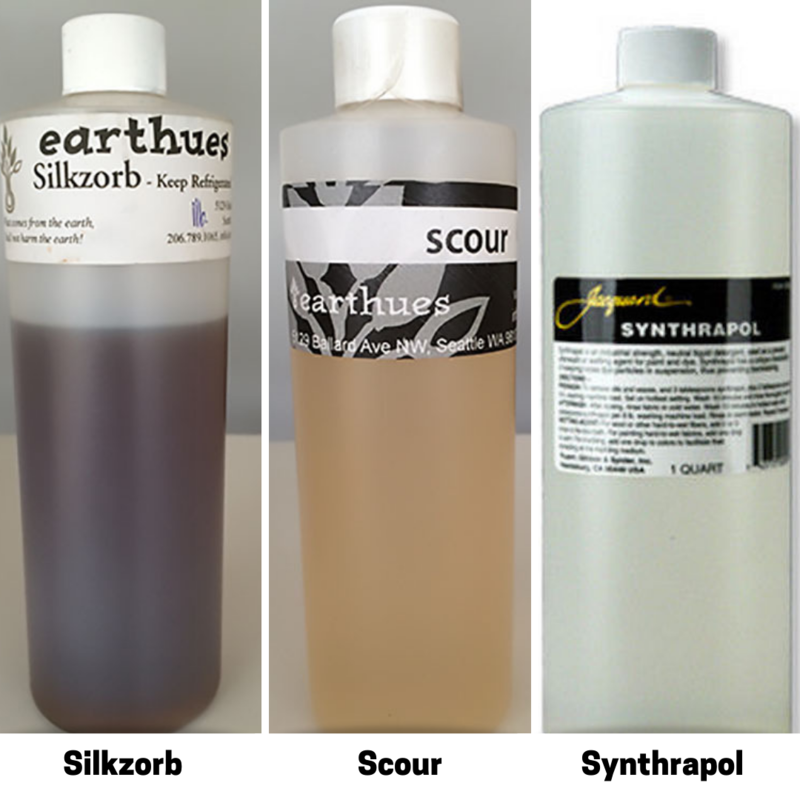 It works on cellulose and bast fibers in combination with soda ash and heat and thoroughly cleans cellulose fibers, removing excess wax and other materials which could inhibit the takeup of dye.” 3) “Synthrapol® is an industrial strength, pH neutral, liquid detergent used as a prewash and afterwash for dyed or painted fabrics.” Synthrapol works well with both protein and cellulose fibers. Use with a small amount of Soda ash in the prewash for cotton and other cellulose fibers.